Sunshine At Night Vinyl - Buy Now! We are please to announce the release of Sunshine at Night as a complete 12" vinyl record. Our good friends at Calgary's Saved By Vinyl have put it out and you can buy it right here. Or you can buy it in Toronto at Criminal Records and Rotate This or in Vancouver at Red Cat Records. Vinyl is a great way to fully appreciate a full size view of the cover art painting done by Toronto's Matt James. Each record comes with a free mp3 download code courtesy of Zunior. Live in Toronto, The Violet Archers perform “Transporter” at Global Village Backpackers as part of NXNE on June 13, 2008. Tune into the CBC Radio 3 Canada Day "Sing For Your Request" Podcast to hear the Violet Archers, Rheostatics and plenty more pure Maple Serum. Presenting the brand new video produced and directed by Carole Larsen. Courtesy of Calgary's amazing Saved By Vinyl label, Sunshine At Night will soon be available on vinyl. More details coming soon. For now, why not check out some photos from our recent performance as part of the Kelp/Saved By Vinyl BBQ at NXNE in Toronto. Thanks to Chromewaves for taking the shots. The Violet Archers Perform "Sunshine At Night"
Live from our jam space in Toronto, here is the band performing "Sunshine At Night". Stay tuned for upcoming tour dates in Ontario later this summer. Also, don't forget the CD Release show in Toronto on June 20 at the Cameron House. Sunshine At Night Available Today! The new album is officially released today on the Zunior Label. You can buy album digitally at Zunior.com in MP3 or lossless FLAC format. Also, Zunior has the album in 'Double Delivery' format which means you get the MP3 format instantly and a CD in the mail. The CD is also available in record stores across Canada, available through Outside Music Distribution. Buy the album now right here. Zunior is about to a launch a brand new video site featuring videos, live shows and features. The very first feature will present the band playing live in our Toronto rehearsal space. Playing a snippet of the new single "Sunshine At Night", check out this promo for the feature coming soon to Zunior. It is official! 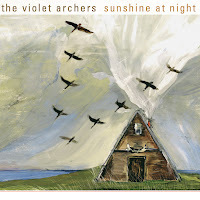 The brand new album from The Violet Archers called Sunshine At Night will be released on May 6 through the Zunior Label. Distributed by Outside Music, the CD will be available in record stores across Canada. You can also purchase the album in digital and CD format through Zunior.com. Stay tuned for details on the album release party in Toronto and live dates across the county. Check out this video of the band live at the Gumboot - Robert's Creek, B.C. Video footage complements of Richard Chapman. 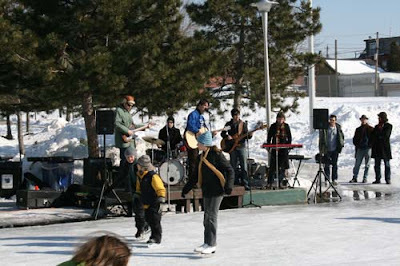 The Violet Archers rock the rink and raise money for Right To Play. The Gas Station Islanders Win! Just trying out my new blog tools. 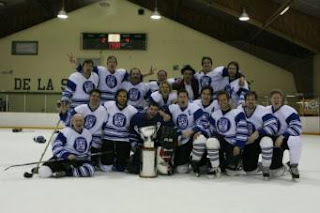 Hey, the Gas Station Islanders won the Frank Frederickson division this week-end at the 10th annual Exclaim Cup. Welcome to the brand new Violet Archers website. The new album Sunshine At Night is coming soon on the Zunior Label. Stay tuned for more album details and regular news posts right here. The Violet Archers are seasoned-veterans who know how to make magic. Case in point, helmsman Tim Vesely spent two decades as a revered singer and multi-instrumentalist for Canadian rock icons, The Rheostatics. Furthermore, on Sunshine At Night he is joined by acclaimed singer and pianist, Ida Nilsen (Great Aunt Ida, Buttless Chaps), drummer Camille Giroux (Sarah Harmer), bassist Scott Remila (Raising The Fawn) and guitarist Yawd Sylvester (Wayne Omaha). Together the band has crafted a stunning sophomore album of vibrant and lush indie rock.